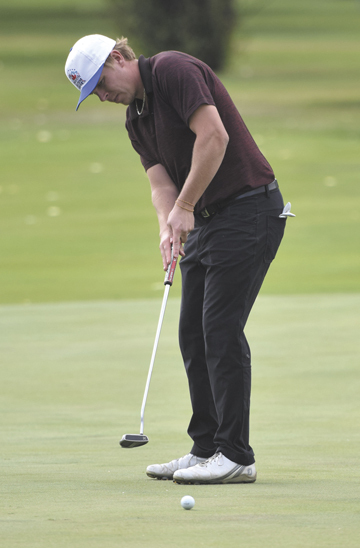 Southern Alberta News Photo PHOTO SEAN ROONEY Ryan Werre putts at the 18th hole of the Connaught Golf Club during the final round of the Southeastern Open Monday, Sept. 3, 2018. Ryan Werre doesn’t have the passion anymore to play professional golf, ending a three-year career, and that is bad news for competitive amateurs in southeast Alberta. The 26-year-old native of Redcliff just capped off his second local tournament win in a three-week span, taking home the crown at the Southeastern Open, Connaught Gold Club’s annual main event. He’d won the Medicine Hat Golf and Country Club’s club championship earlier in August, with other summer highlights being a third-place finish at the Victory Day Open, and a sixth-place showing at the Alberta Open in June. But while stellar play and tournament titles will no doubt lead some local youths to take up the sport, his most inspirational act in golf to date might just be his decision to walk away. Strange as that sounds on the surface, Werre had seen his golf game reach a plateau, and while others around him were moving forward and ahead, he was building up frustrations as he fumbled to reach the next level. Werre sat down with his sponsor, southeastern Alberta businessman Bill Yuill, and told him how he was feeling. By the end of the conversation, Yuill had offered him a job with the Monarch Corporation, and the decision to leave professional golf was finalized. The new career started as a three-month trial, taking on a project here and there, but has evolved into a more full-time position, which he’s really enjoying. Werre is also in the process of getting his real estate licence, which he says will mesh well with what he’s doing now for Yuill. The new path is certainly more than a trial scenario now, prompting Werre to hammer that final steak into his professional tomb — reacquiring amateur status. He applied for his amateur reinstatement part way through this summer, which comes with a probation period that depends on the length and success of a pro career. Werre was given one year from his last professional event, and so will officially be an amateur again as of next June. He’s not unaware that his decision puts some real pressure on other local golfers either, fully admitting it adds to his motivations to be playing in tournaments he knows he can win. On the same token, knowing his best wasn’t good enough as a professional was taking all the fun out of the game. “I just got my head kicked in too much over the last three years, and it’s tough to really want to travel full time and be away from my family full time, when I’m losing by 15 shots over three rounds even though I felt like I played decent. It just wasn’t appetizing for Werre to continue the grind on small tours, scrambling to make ends meet and to keep up with the talent level. Coming home has given him a new direction, new motivation and a clear head. “I enjoyed golf a lot more this summer than I have recently,” Werre says. “It seemed as though when I did get out to play, it was kind of a privilege, and that was refreshing. Werre says some adjustments had to be made to how he practises and prepares, trying to keep the whole game as simplistic as possible. But simplicity is what brought him back to peace of mind, and that’s likely to result in his name engraved on tournament trophies for a long time. Great for local golf. Maybe less so for local golfers.